Casa Anatta Museum houses the permanent exhibition entitled MONTE VERITÀ. Le Mammelle della Verità, curated by Harald Szeemann in 1978. The exhibition is treated as an artistic installation and has been painstakingly restored in keeping with the curator’s original intentions. Szeemann’s exhibition tells the utopian story of Monte Verità. The ground floor houses a new multimedial exhibition by Andreas Schwab entitled Le verità di una montagna, which introduces and contextualizes Harald Szeemann’s exhibition. Casa Anatta is itself a work of art with its timber walls, rounded corners and large flat roof. 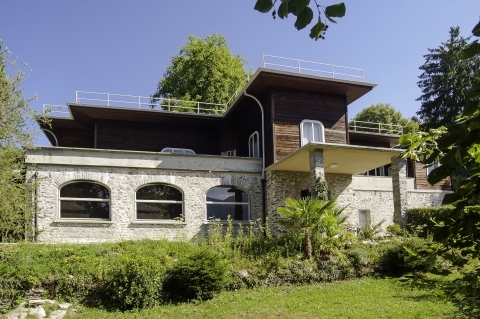 - Casa Selma: “light-and-air hut” (1904), it presents a video on the history of Monte Verità and has been refurbished to its original interior decor. - Casa dei Russi: houses small temporary exhibitions. - The Elisarion Pavilion: with the circular painting named Il chiaro mondo dei beati (currently closed for restoration work). Bus Nr. 1 from Locarno railway station to Ascona (stop Ascona Posta) and then Bus Nr. 5 ("Buxi") from Ascona to Monte Verità. Ticino Ticket: 30% reduction on admission fee (group price excluded). Cultural Pass: 20% reduction on admission fee (group price excluded). App my Ascona-Locarno: 10% reduction on admission fee (group price excluded).